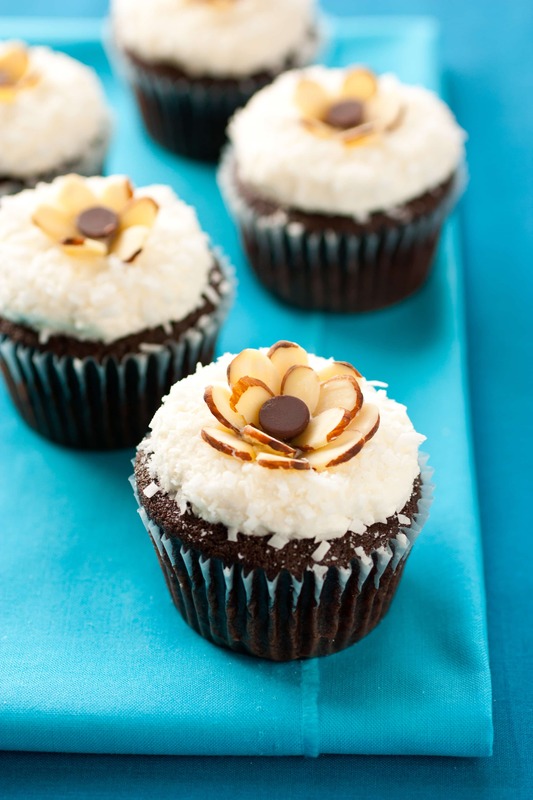 Chocolate Cupcakes with Coconut Frosting – this is such a dreamy flavor combination! You get a rich chocolate cupcake paired with a velvety smooth, luscious and fluffy coconut frosting and they’re finished with shredded coconut and almond slices. These are an almond joy candy bar lovers dream! 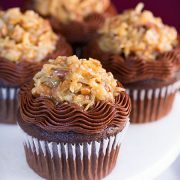 I tried several batches of chocolate cupcakes while creating this recipe and decided I liked this one best. 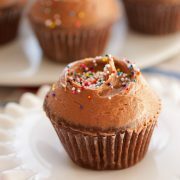 It’s silky texture, moist crumb and rich chocolate flavor makes these a cupcake to remember. If you were ever wondering why boiling water is often added to chocolate cake/cupcakes, it is simply to intensify the flavor of the cocoa . 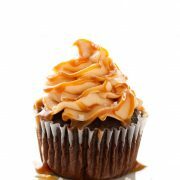 In this recipe I also chose to add the baking soda to the cocoa and boiling water mixture to deepen the brown color to create a beautifully dark cupcake. I thought of making a similar almond joy coconut filling to top the cupcakes with, but I decided I’d way rather have a melt in you mouth frosting instead. Even with the frosting, rather than a coconut candy filling, you wouldn’t believe how much these taste like an Almond Joy simply because they contain the same flavors. Maybe I’m biased and I will likely always choose a fresh cupcake over a store bought candy bar, but I think these are far better than an the candy bar version. You can top these cupcakes as you like. If you want you can even leave off the almonds or shredded coconut and you’ll still have an incredibly delicious cupcake. If you are looking to do the flowers on top out of sliced almonds, I’d recommend when you purchase the almonds that you look for a package of them that still has the skins intact around the edges, and ones that aren’t all broken into bits. Also, if you want to make them simpler you can do 5 – 6 petals instead of making a double petal layered flower. Enjoy! This is such a dreamy flavor combination! 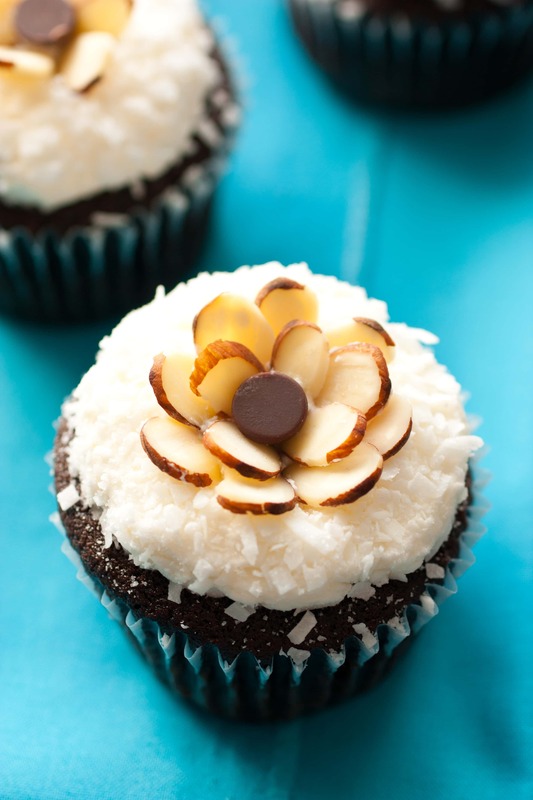 You get a rich chocolate cupcake paired with a velvety smooth, luscious and fluffy coconut frosting and they're finished with shredded coconut and almond slices. These are an almond joy candy bar lovers dream! Preheat oven to 350 degrees. In large heat proof mixing bowl, whisk together cocoa powder and baking soda. Carefully pour in boiling water and whisk until bubbling subsides and mixture is well blended, allow to cool for 5 minutes. Meanwhile, in a separate large mixing bowl, using an electric hand mixer set on low speed, blend together melted butter, vegetable oil, granulated sugar, vanilla and salt until well combined, about 30 seconds. Stir in eggs and eggs yolks, mixing just until combined after each addition. Blend in lukewarm cocoa mixture then blend in heavy cream. Slowly mix in flour and blend until combined, while scraping down sides and bottom of bowl. Divide batter among 24 paper lined muffin cups and bake in preheated oven until toothpick inserted into center comes out clean, about 18 - 20 minutes. Remove from oven and allow to cool in muffin tin several minutes before transferring to wire rack to cool. Cool completely then frost with coconut frosting. Sprinkle each frosted cupcake with coconut (before frosting sets), leaving about a 1/2 - 1 inch circle in center of cupcake uncoated with coconut. Gently press 5 or more sliced almonds around 1 chocolate chip in center of cupcake, or gently press 1 whole almond into the center of each cupcake. Store in an airtight container. In the bowl of an electric stand mixer fitted with the paddle attachment, whip together butter and coconut milk on medium-low speed until combined, then increase speed to medium-high and whip until very pale and fluffy, about 6 minutes. Blend in coconut extract. With mixer set on low speed, slowly add in powdered sugar then increase speed to medium-high and blend until fluffy, about 2 minutes.